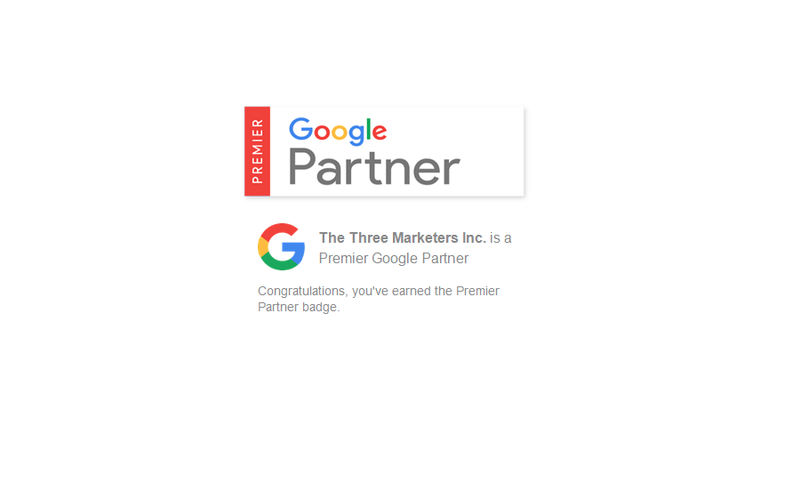 It’s official, The Three Marketers has officially been upgraded to Google Premier Partner status, currently the highest level possible in the Google Partners program. Only 3% of Google certified agencies have achieved this qualification. The status rewards agencies that have demonstrated exceptional AdWords management skills and expertise. Google Premier Partners are required to stay up-to-date with the latest advancements and changes and must pass rigorous testing to obtain certifications in all aspects of online marketing: Search, Shopping, Display, Video, App, and Mobile. Google Premier Partners are recognized for delivering optimum results, developing campaign manager skills, and continually seeking new opportunities for clients. We, at The Three Marketers, are honoured to receive such hard-fought recognition from Google. Our goal has always been to obtain the best results possible for our clients, and we’ve achieved this by staying on top of the latest marketing technologies and trends. If your business is interested in a high-performance Google AdWords campaign, do not hesitate to contact us today for more information.